NextOne leg, two leg, three leg, more? Leveraging systems change comes when you are willing to examine the system itself, not just the component parts. News media is struggling to remain financially viable in a time when readership / viewership is high and revenues low by considering ways to adapt to an online world and the way it thinks about the problem will go a long way to whether it can solve it. 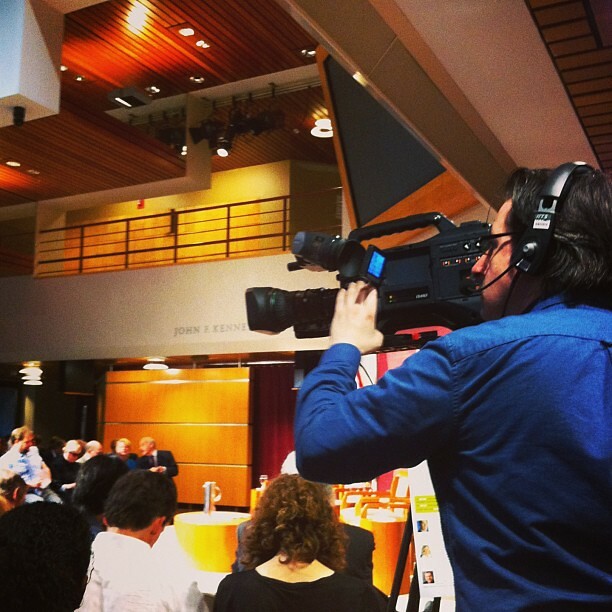 Last night The Joan Shorenstein Center at Harvard University hosted an event launching the public face of an initiative called Riptide, which sought to create an oral history of journalism as it transmophizes from independent media like paper, television and radio into what I would say is transmedia and social media. The Riptide Project has already been criticized for its lack of diversity of its subject matter to the point of being called “The History of Internet News, as Told by Rich, White Men” , although for its many faults it does bring together individuals who have shaped the landscape of the English-language news. That story is still worth listening to and learning from. The event was organized around a panel featuring AOL Chairman Tim Armstrong, Caroline Little – head of the Newspaper Association of America, and New York Times publisher Arthur Sulzberger Jr. The one hour event featured some wide-ranging discussion on how mainstream media has responded to digital challenges and is seeking to promote quality journalism amidst all these threats (A summary of key points are summarized in a Storify (click link)). Among the points that stood out was one NOT discussed and that was around the news systems themselves. While AOL, local newspapers and international publishers like the NY Times were exploring different media vehicles for news — such as AOL’s Huffington Post and recently scaled back local news network Patch — the way journalism was to be done was basically the same, except for journalists this means more work. There was much handwringing over the threats to the system of journalism and publishing without seeing it as a system that itself requires adaptation at a fundamental level. The parallels with academic publishing are startling. For all the talk of high-impact scientific publications, the truth is that getting an article included in a top-flight academic journal is — if it is very well received — is likely to garner less than a few dozen citations. Yet the amount of energy and resources that go into these publications is enormous. Academic journals are seeking to respond to this challenge by using open-access and web-based publishing, but the same fundamental challenge exists: adapting to new media while keeping the old. The publishing model is not developing, it is adapting to threats and not necessarily in a way that is resilient. Developmental evaluation and design is about transforming the system as you move it along. It means being willing to examine or re-examine commonly held assumptions and working with changing conditions as they change, not just upon past reflection as we saw last night. It also means considering what developing a program is all about, not just improving it. Slide number 17 of the presentation below illustrates how this might look in practice. Developmental evaluation is not about program improvements, it is about developing them further to adapt and respond to changing conditions. The resulting program response might be something that is more effective at achieving goals, but that is not the primary focus. For journalism the risk is that they will add all these additional layers to their product without questioning the assumptions behind what it means to do good journalism. 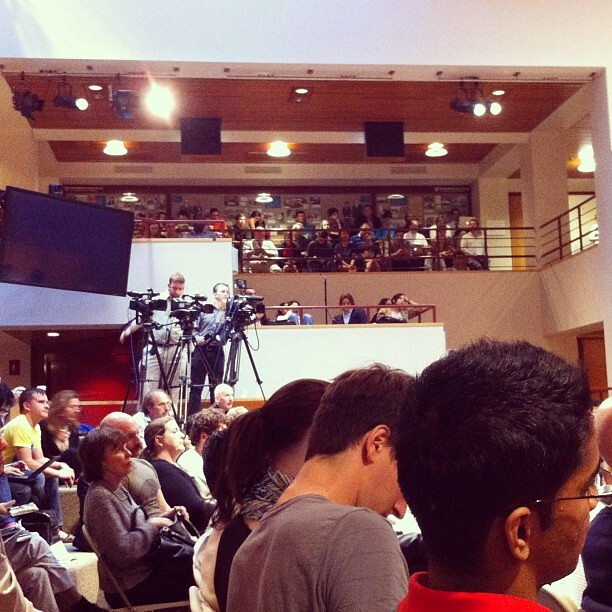 Are journalist going to be videographers, photographers and web coders as well? The point was raised that the Huffington Post has a climate where journalists sit next to engineers. While creative and useful for looking at innovation, it doesn’t help if journalists, editors and publishers are still also doing all of what they used to do and now need to add on additional activities. At some point it all suffers. Yet, the panelists also argued that strong brands like the NY Times will do well when quality markers fail in the sea of low-brow content. How can this be if the resources to do good reporting aren’t there? You can’t act like a budget outfit, but claim to be bespoke. Academics and scientists are in the same situation. They are being pushed to deliver high quality science and teaching in an age of diminishing resources, with few good metrics to assess outcome, TED-worthy presentations, Tweet, blog and get into the community to speak to end-users. It is a lot and might even be possible if the system changed to support it. Instead, fewer resources are given, less support for excellence provided and the expectations rise. Without quality knowledge translation — whether it be great science journalists or outstanding health scientist or clinical communicators — our entire system will collapse. There is too much information to sift through, it is too complex of a system to operate in, and there are far too many actors to navigate it well. Journalists and their institutions can provide common touch points for many across the system and the woes, challenges and systems issues they face are ones we face in health sciences. Learning from what they did and didn’t do in the realm of communication is worthy as is watching where they go as we seek to question if other areas of health communication need to follow. One leg, two leg, three leg, more?